← “LIVE YOUR DREAMS’ Celebrate Dr. Martin Luther King, Jr.
“The Legendary Ms Etta James” Rest In Peace! Well, here I am once again! In mourning of a great legend!! We must give the legends who started it all their just due BEFORE they leave this earth everybody!! These are the ones who opened the doors for the ones that are here now damit!! Etta James, what can I say about her? Well, her career spans many years. She did rock and roll, soul, gospel, R&B and blues, just to name a few. Not many singers can do that. She was the artist that bridged the gap between R&B and Rock and Roll. Yes, is was she. She had hits like, ‘Dance with me, Henry’, ‘Tell Mama’ and ‘I’d Rather Go Blind’. And of course, ‘At Last”, the title of her album in 1960. She has won 6 Grammys, 17 Blues Music Awards and was inducted into the Rock and Roll Hall of Fame in 1993. This list goes on for this remarkable woman. I always say she put the blues in jazz, much like what Billie Holiday did. They both had the same problem with addiction. It is a road that many singers go through. There are many challenges in this profession that most people do not know or understand. To bare your soul, to be open like that, sometimes lead the wrong people to you. Etta got through it somehow. She actually performed at the Apollo Theater last year I learned just the other day. I remember when I was in an all girls jazz band called, ‘B Natural’. We had some really great musicians, one being Mindy Abair, a really great saxophone player out of Berkley School of Music who is one of the top jazz recording artist today. Shout out to Mindy!! I was the lead singer in the band and one of the songs I was to perform was a song called, ‘At Last’. I fell in love with the song right from the start, it sang itself. There are some songs like that, they just flow and you ride with the energy the lyrics and music send to you. Well, we did that song in a live concert that was broadcast on the radio in the San Diego area. There were music critics and lots of people in the audience that night as it was B Natural’s debut performance and everyone wanted to hear this new all girls jazz band and the new jazz singer Peggy Dodson. Singers have certain songs that help you set the tone for the night. ‘At Last’, was that song for me and B Natural. Mindy Abair and I did a horn, vocal thing together on that song that still brings chills up my spine! We were in the moment of creation!! “At Last’ has been one of my all time favorite songs every since I begin singing it. 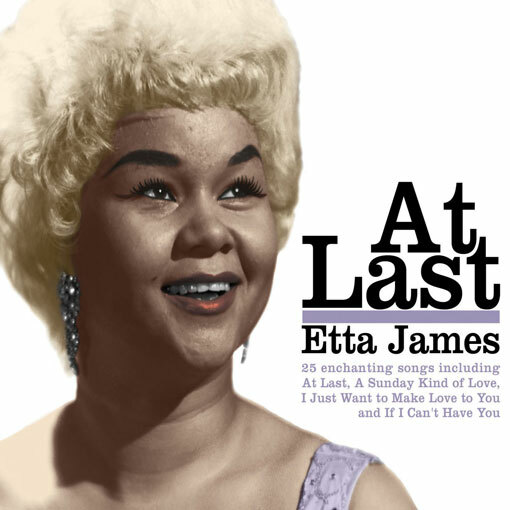 Many singers have sang the song but Etta put the mark on it!! I give you your props my legendary Queen!! May you rest in peace!! You have joined GOD’s Choir and what a choir that is!! Thank you for all that you have given us here on this earth Etta, you will live on forever!! This entry was posted in Etta James and tagged Black History and Culture, Etta James, ICONS, jazz, Legends, music, Music Legends. Bookmark the permalink.